During this month all 7 sets in the Georgiana collection are available for just $35! Have you considered getting these designs and creating something very special with them? Let me share some of the possibilities. 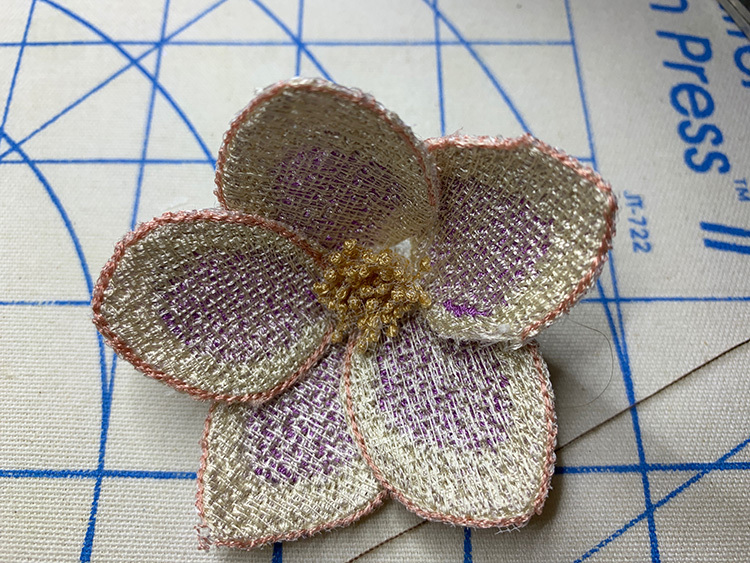 I have now sadly come to the end of creating all the designs for the Winter Jewels collection, capturing the beauty of the hellebores in my garden, fondly known as Christmas roses. There are so many ways to use these designs, and plenty of options. Look at the centre of this one just opening last week, which I found inspirational. 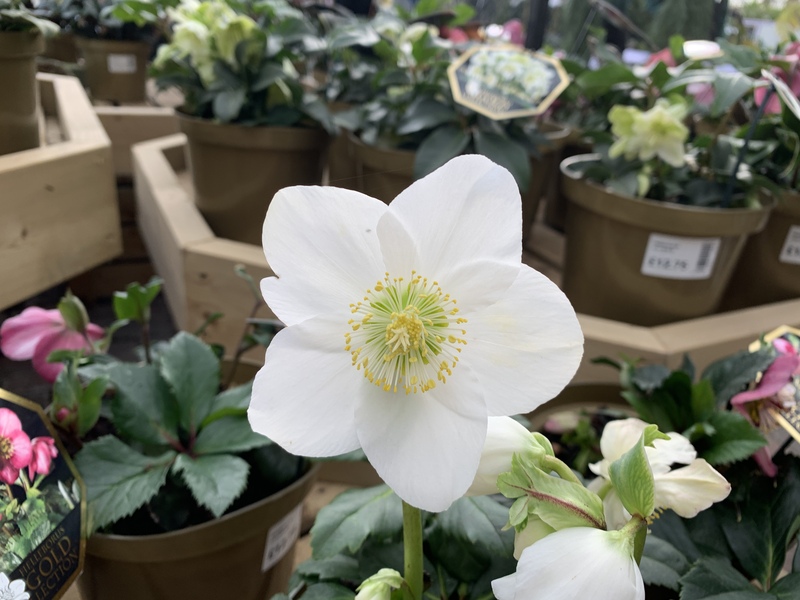 It had me looking again at the hellebore centres and how I could create an alternative as a final flourish. This January I am giving you all a beautiful design. 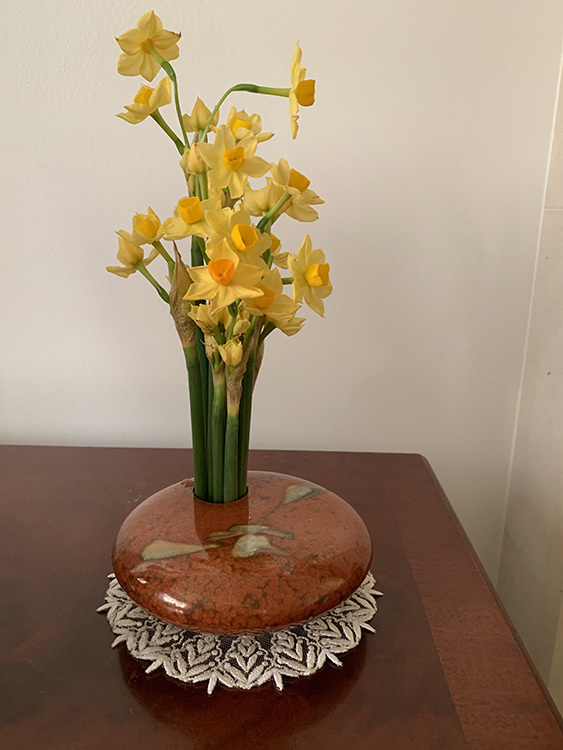 You see it here with my Japanese ikebana with some of the first small daffodils of the year. These are so pretty and I cannot resist them when they appear in the supermarkets. A hint of what is to come. Here it is loaded on my machine ready to stitch out with 2 thread colours. I stitched mine in my 8″ x 8″ hoop. As you can see it has 22,824 stitches. You can see I used 2 pieces of wash away stabiliser overlapped to create one layer. If your stabiliser is not wide enough for your hoop, this little trick works very well. A slight spray of temporary adhesive will keep the 2 sections together. I have not tried glue sticks as they are likely to dispense too much permanent glue. Note how I use a T pin to hold these 2 layers securely. I forgot to take a photo of that so my apologies for showing a different stitch out for Winter Jewels. 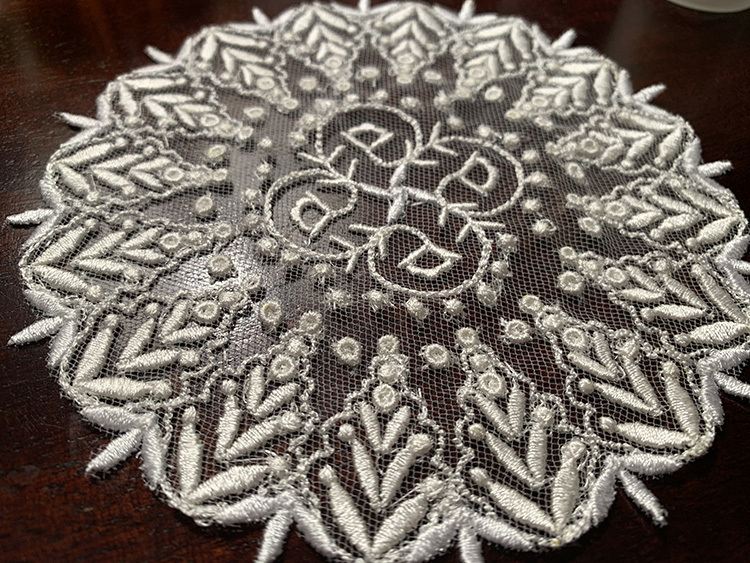 I love this element of Regency Whispers and have used it for the main part of the design. 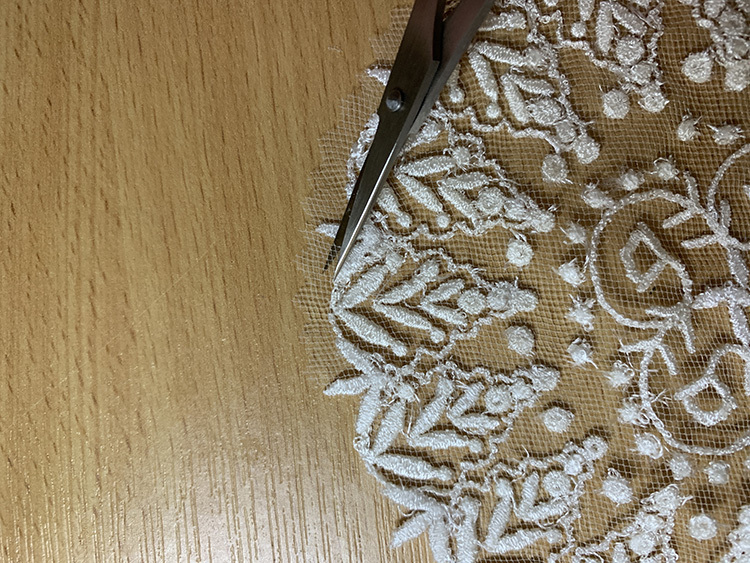 The ivory tulle is hardly visible but it is there supporting the embroidery. The main section here is nearly complete. 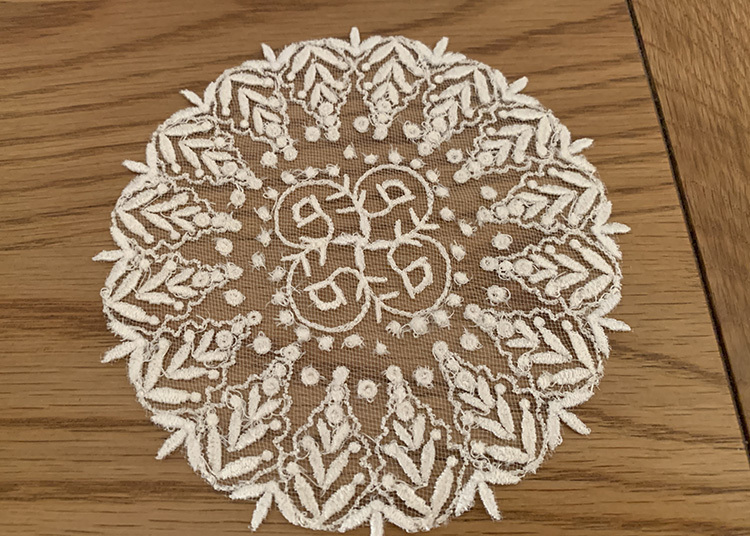 I used ordinary bobbin thread for this but you could use the same thread top and bottom, but the embroidery would be marginally thicker. 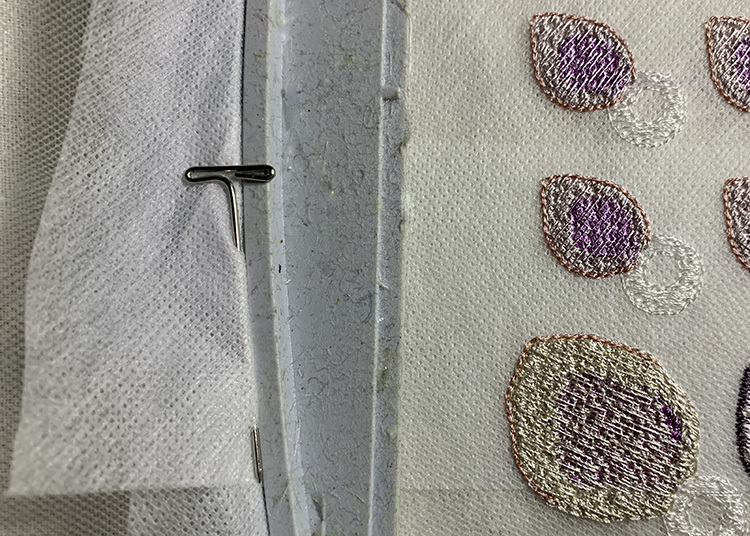 It is important when the embroidery is finished to snip as many of the jump threads as possible before you wash the stabiliser away. 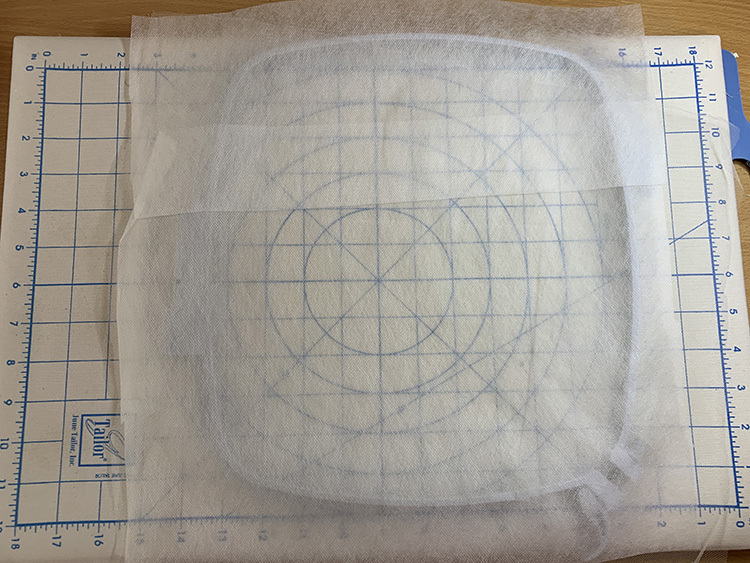 This protects the tulle from being cut by mistake. 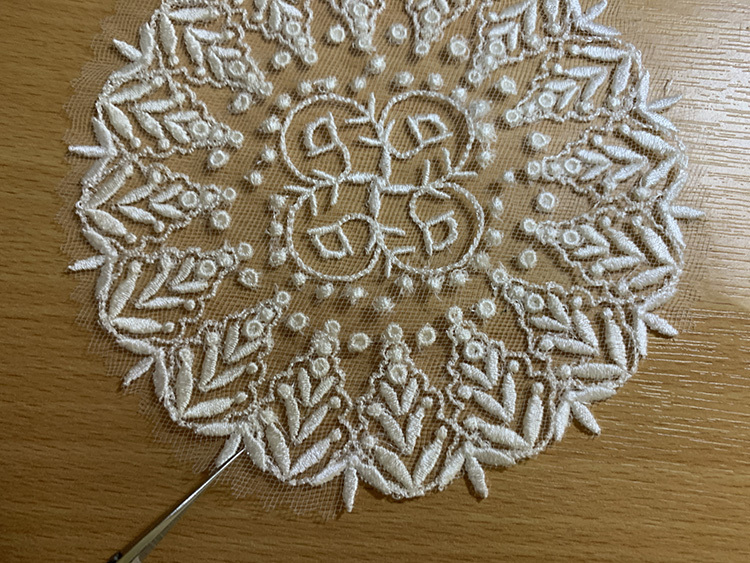 I was quite severe in my snipping confident that the embroidery will not unravel. Before I washed the stabiliser under a running tap I had cut around the design about ½″ from the edge with my pinking shears but decided this did not look good. 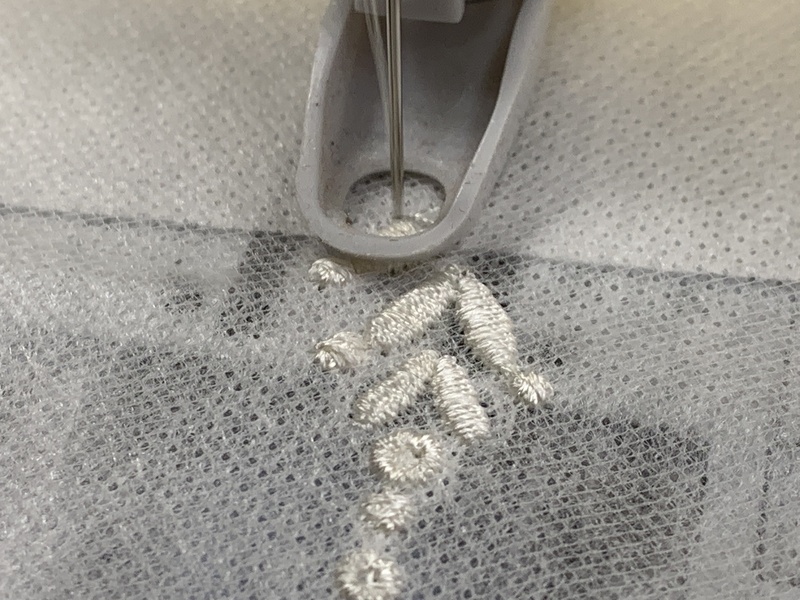 I prefer not to soak embroideries until nearly all the stabiliser is washed out. I left it to soak overnight and left it to dry naturally. The I cut each side of the points all around the edge. Always cut into a corner never out of one if possible. Lastly I trimmed between the points. After pressing it from the back I did more snipping using very sharp scissors. This is definitely the right side, a vast improvement. 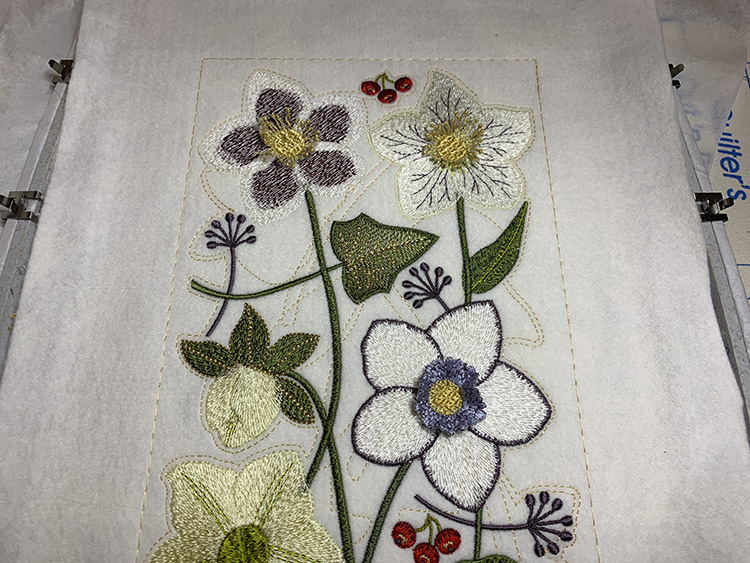 You can test out this design for free providing you are a member of the Graceful Embroider Group Forum. Please join today so you can download it from the Freebie page within the group. 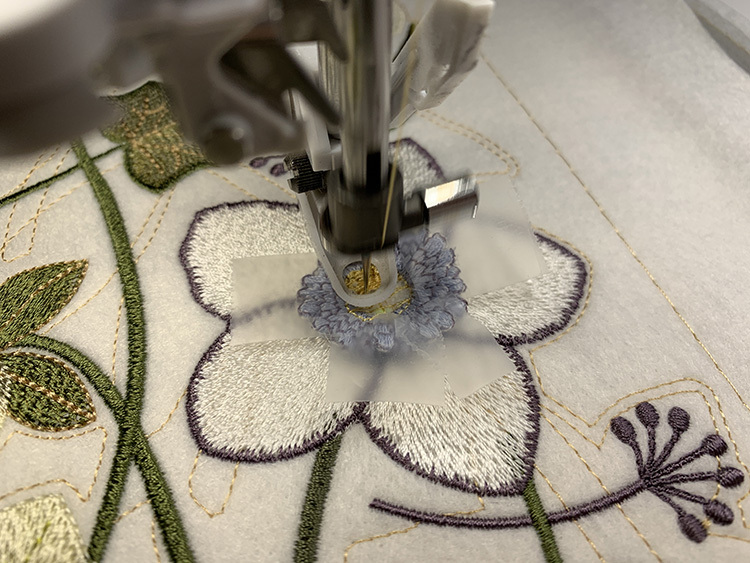 You may have to wait for up to 36 hours for approval if there are lots of new memberships and you need to have opened an account at Graceful Embroidery. 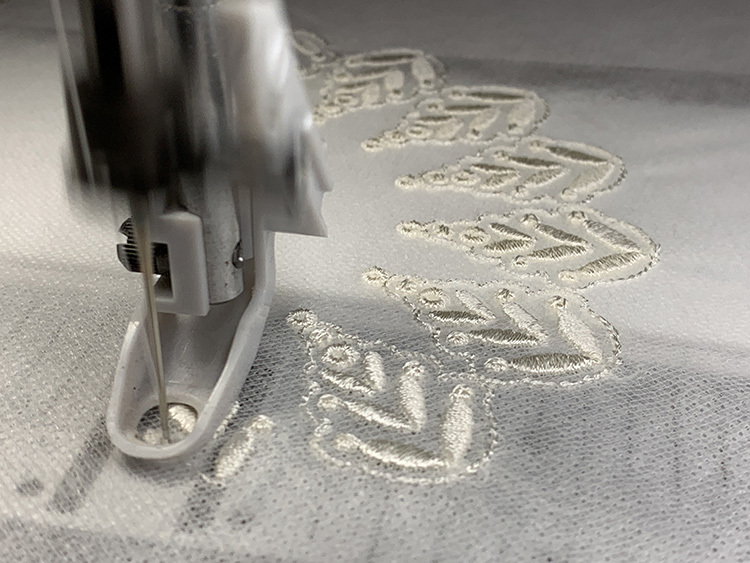 As an avid digitiser I had to embroider my New Year’s message for you all! Rather than create something new I decided to take one of my favourite collection and create a new design with the elements. 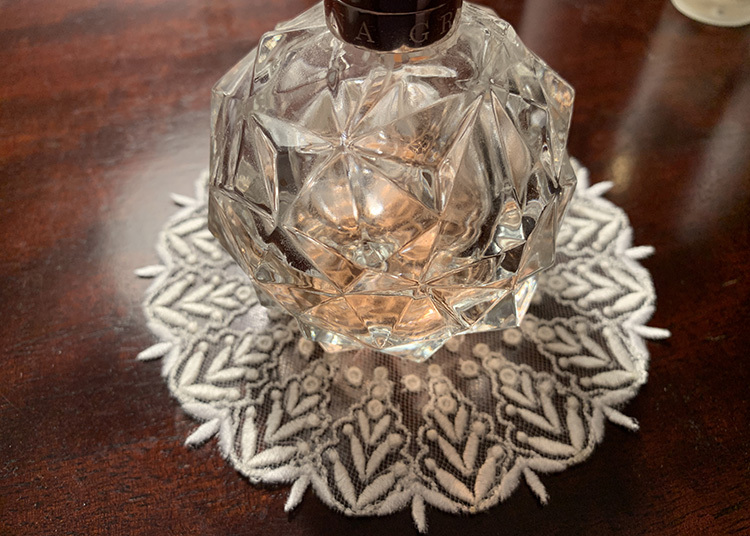 This is the result and you can purchase the designs in January 2019 for just $7.50. What a bargain to start a year of embroidery. 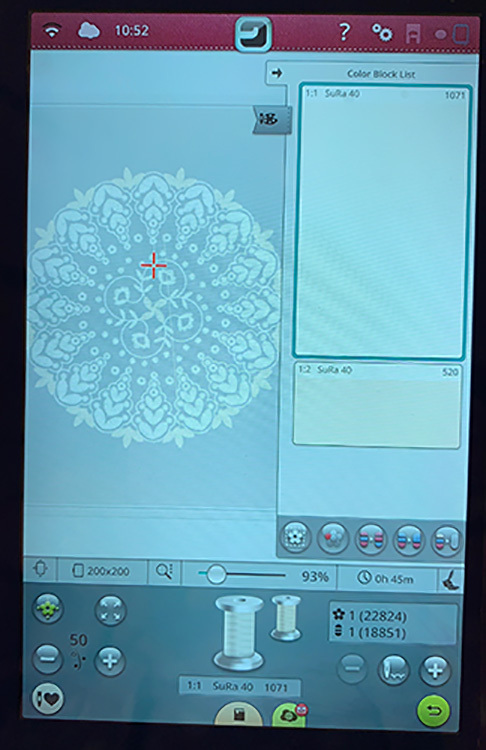 Back in the summer after seeing that remarkable embroidered veil which was worn by Meghan Markle, I knew it was time to digitise some unique designs for veil embroidery. The Rachel Kathryn Bridal collection is named after my eldest daughter. 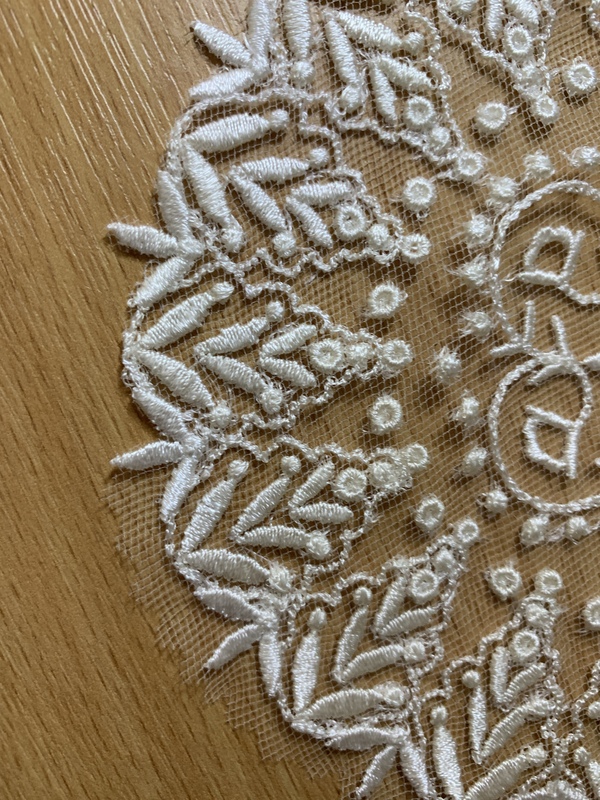 Some designs really lose their depth and detail when they are stitched out in just one colour. 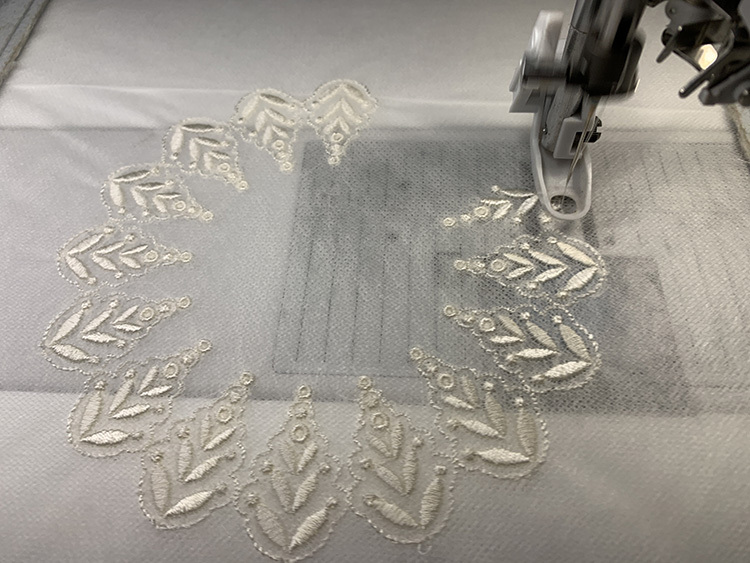 The collection has been created to keep the details of this distinct embroidery using various white and ivory threads, and successfully on sheer fabrics. This Christmas it seems that we have all become fascinated with decorative Nutcrackers due to the release of the film, the Nutcracker and the Four realms. I well remember my first attendance at Covent Garden, London to the Royal Ballet perform Tchaikovsky’s wonderful ballet of the Nutcracker, so when I decided to digitise some of these charming figures, I decided first to do my homework and find out more. Over the last few weeks I have been putting the finishing touches to my new collection, which is called Winter Jewels. 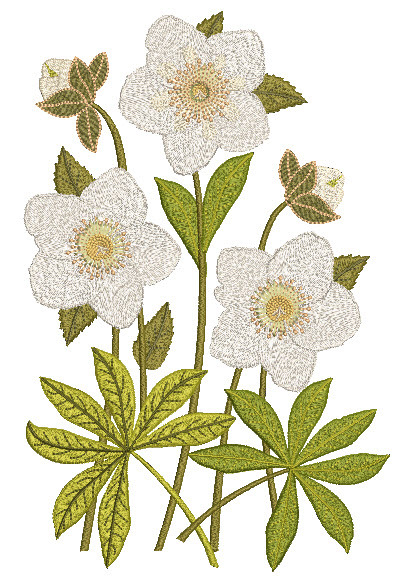 These designs celebrate the beauty of the Hellebore, known as the Christmas or Lenten rose. This is however much more than a collection, but a botanical study of these magical flowers that are actually made up of sepals not petals.